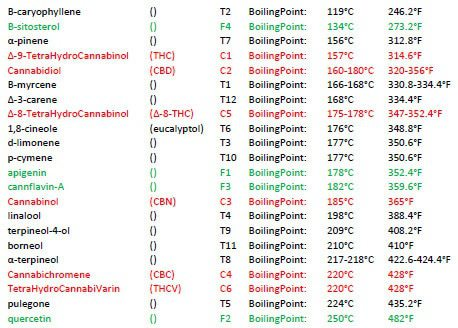 A lot of the terpenes in cannabis boil off around 80 to 90 degrees. Why a lot of indoor growers get hay/grass bud cuz the light cooks off the smell if its too close.So if your drying in those temperatures it'll smell like grass and possibly end up smelling like nothing cuz all of the essential oils are gone. But some strains do not smell as much so it could be both things combining in a bad way. So, this is saying the terpenes would basically have to boil in hell or lava to burn off? Damn! This means that I have no idea now why my bud has no flavor aside from genetics and I have the same strain from 2 different breeders. So, WTH is my problem then? What are your drying and curing environments like? Well, I was drying in my garage in the summer and it was hot as hell, like high 80's RH around 67% and it dried super fast. I have since moved my last harvest inside the house, my office and it ranges from 75 to 65 f and humidity in the last 3 weeks has been anywhere from 50 to 70. I don't have any special equipment to measure. I just have a fan blowing in there, circulating air with the doors and shades closed. This time, I'm at almost 3 weeks drying time and buds are snapping but with a bit of string action, so I assume any day now they will be ready to jar. Umm... Curing is inside a dark cabinet in ball canning jars. I don't think that's quite what it's saying. Looking at just the boiling point in that list can be a bit misleading. Think about water as an example. Water at sea level boils at 100C but yet still evaporates even if the temperature is much less. Or, how does ice evaporate even if the temperature is below zero. Other volatile compounds can do the same thing. The amount of the substance in the surrounding atmosphere (humidity for water) + temperature determines how quickly the evaporation will occur. Not that this is the case here. So, I had one batch that I started drying in the garage for about 3 days that I ended up bringing inside. It is dry as of today and although I have a cold and didn't really want to test it cuz my sniffer and taste buds are off, I did. It seems to taste better than any of the stuff I dried in the garage in the summer, but it's kind of hard to tell. I can say there has been zero odor from these plants since I have hung them inside to dry except for the original slight drying plant (any plant) smell. I believe this is what is supposed to happen in a good drying environment...? Well @_randomguyinthewoods , according to @Northern_Loki post No. 65 you may be correct as boiling point can be misleading as other factors exist. And darn it! I wish for a botanist up in here! Where are you, botanists of the world? We summon you? We love you? We need your knowledge! Do volatile terpenes evaporate quickly at room temperature? Is there an "official" room temperature? 72f or something? 3 weeks drying ? Sample some, just a tiny bit, crush it, smell, and smoke if possible. Yeah without curing. Slow drying at good temps is great, everything will improve with a nice cure but this way of drying shoud already give you a really not bad smoke at all. E.g. let's see, Myrcene's vapor pressure is 2.09 mm Hg at 25 deg C for example. This is less than water whose vapor pressure is 23.7 mm Hg at 25 deg C. This tends to indicate that water is more volatile than Myrcene at around room temperature when the pressure and humidity is the same, for instance. alpha-pinene has a vapor pressure of 4.75 mm Hg at 25 deg C. This indicates that it is more volatile than Myrcene but less volatile than water. The higher the vapor pressure, the higher the evaporation will be. And, it is not linear with temperature. As the temperature increases, the rate of evaporation will increase likely in an exponential fashion (I think). In most cases, looking at the boiling point (e.g. in the table) gives you a general idea as to the volatility and rate of evaporation at temperatures that are less than boiling. From the vapor pressures, you can get a general idea of how fast something will evaporate. But, even though water is more volatile, there is most certainly much more water to evaporate away than the terpenes. Calculating actual rates of evaporation, the starting point would be the latent heat of vaporization aka enthalpy of vaporization or evaporation which is the amount of energy (enthalpy) that must be added to a liquid substance, to transform a given quantity of the substance into a gas. The Heat (or Enthalpy) of Vaporization is the quantity of heat that must be absorbed if a certain quantity of liquid is vaporized at a constant temperature. A different or more complex substance complicates it further. It is not a simple thing to figure out but there may be some short-cuts. I'll look around but this might be something a bit off-topic and suggesting something that may not be the primary cause in this op. But it is an interesting question in general. Is there more info in that cool table such as vapor pressure, cannacrab? I didn't understand a word of it. Damn @Northern_Loki you have to dumb it down for us simple folk! I think this is a very important take-away from your very contribuiative post. I didn't understand a word of it. Lol. Sorry. These type of questions get me excitable as there is something in the question that could use some figuring by the OG community. Summary response to the question "Do volatile terpenes evaporate quickly at room temperature?" Water evaporates faster than terpenes at room temperature but there are much less terpenes to evaporate than water. So, the loss of terpenes can appear significant during drying since there is such a small quantity of terpenes available to evaporate (relative to the quantity of water). Which doesn't answer anything, actually. Just generalities. Requires more study and thought to get to a real answer. Also kind-of points to the reason of why "low and slow" generally should work better in keeping the terpenes around (non-linear nature of evaporation of liquids). the starting point would be the latent heat of vaporization aka enthalpy of vaporization or evaporation which is the amount of energy (enthalpy) that must be added to a liquid substance, to transform a given quantity of the substance into a gas.